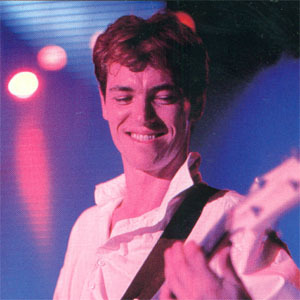 John Giblin joined Simple Minds after the departure of Derek Forbes. The band were writing and rehearsing in his recording studio, Barwell Court, when Derek was asked to leave and so John was asked to step in to fill the void. (Although John only accepted the role after talking it through with Derek). The internationally renowned double bassist and bass guitarist had already worked with many notable artists (Kate Bush, Peter Gabriel, John Lennon) and was first publically seen with Simple Minds for their Live Aid appearance. After recording duties on Once Upon A Time, he accompanied the band on the subsequent world tour and was therefore featured on the live souvenir Live In The City Of Light. He also joined the band for writing and recording sessions for Street Fighting Years with Let It All Come Down being his sole composition for the group. However he left the band after the recording of the album. The reasons for his departure have never been revealed.